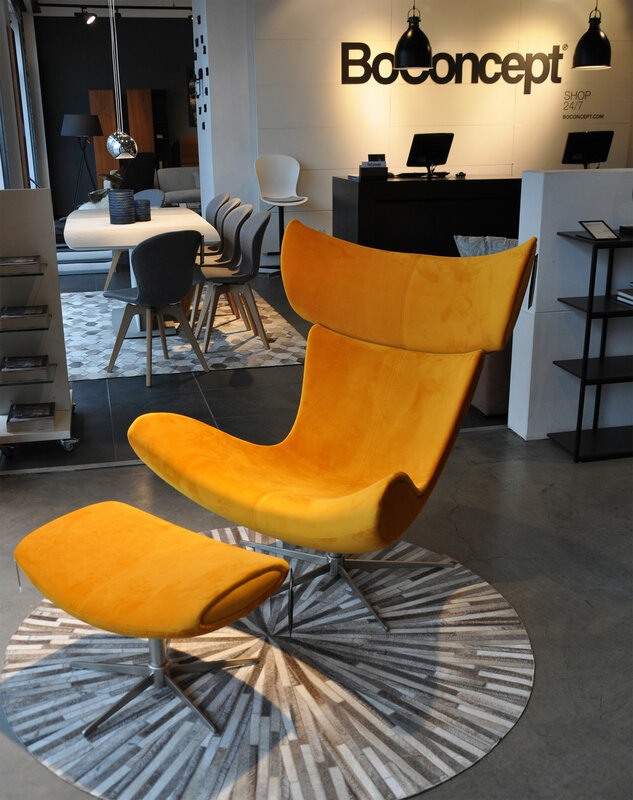 This post is written in collaboration with BoConcept Manchester – read on for a competition! When I was younger, I used to rip interiors pictures out of magazines, and save them in a big old folder. Floral shabby chic sofas in American coastal homes, enormous gilt mirrors in Venetian palazzos, Ikea kitchens in London Victorian houses, modernist white leather occasional armchairs in French farmhouses against reclaimed brick walls - I saved them all for the longed-for day when I had a house of my own to decorate. Lugo side table, Reno armchair. We bought our first house before Pinterest has been invented, and I somehow managed to paint and furnish it with the help of magazines like Ideal Home. Our old living room had duck egg blue and coffee-coloured walls, which we thought was fabulously chic :-) After moving to our Victorian great dame I spent hours scrolling Pinterest, saving picture after inspiration picture. Then I began using Instagram, and was immediately deluged by thousands of images of normal British homes like ours. Sheepskin, Torrino table, Florence chairs, Hexagon lanterns on Bordeaux shelving units. There’s so much choice out there, and so much inspiration - and when you’re not a trained designer or decorator, it can be incredibly hard to create a room design that is beautiful, useable, affordable, reflects your unique personality, and doesn’t look like exactly like the rooms you’ve seen on line. I love interiors but I’m no expert by any stretch of the imagination. I think of myself as a slow decorator - I’ll find a wallpaper that I love, and then live with it pinned up on the wall for six months before deciding to go for it. We still haven’t painted the dining room ceiling nearly two years after the builders left, because I know that I want a colour of some kind to highlight the amazingly elaborate original cornice, but I haven’t hit on the perfect shade yet. Pink, to give the room warmth (but not too saccharine, or too lilac-adjacent, or too close to bare plaster) - or a blue/grey like Farrow & Ball’s Oval Blue - but is that too similar to the living room wallpaper? Milano table, Adelaide chairs, Adana rug, Handle Me pendant, Hexagon lanterns, World Map Concrete Art. Aarhus chairs, Billund table, Ankara rug, Kuta floor-standing lamp. I spent a lovely morning at the weekend with the interior design team at BoConcept Manchester, marvelling at the new season’s range (the showroom in Ancoats is stunning, well worth a visit, and you can treat yourself to lunch at Mackie Mayor on the way), and learning about their interior design service. Here’s something pretty cool - the BoConcept Manchester team will help you to decorate a single room, or your entire house - including their furniture and accessories - plus complementary paint, wallpaper and flooring from other brands - with mood boards and CAD drawings - and home visits or in-store consultations - for free. Shall I say that again? It’s free. I think that’s amazing. And isn’t it the perfect solution for when you’re someone like me who likes so many different styles and just needs a bit of help to nail down a design - with the input from an experienced professional designer who can suggest pairing this sofa with that wallpaper and this paint and this lamp and this flooring. Osaka sofa in turquoise Napoli fabric, Palencia rug, Wire stool in matt pink. David, one of BoConcept Manchester’s interior designers, explained the typical process to me. He encourages clients to bring in inspiration pictures from magazines and social media. The first question he asks is this: how do you want to feel when you’re in the room? How do you want to use the space? Clients are encouraged to wander around the gorgeous showroom, getting involved with all the lovely textures - velvet, boucle, smooth wood, silky brass - and find out what they feel particularly drawn to. Palencia rug, Osaka sofa in turquoise Napoli fabric. Apparently at this stage a degree of marriage counselling is sometimes required, when two partners have completely diametric tastes, and one person adores the curves of the incredible Imola chair (which is made by hand in BoConcept’s European factory by one of the four craftsmen in the world who are qualified to make it), while the other falls in love with the simple, clean lines of the Ottawa dining table (a range designed by Karim Rashid, which pairs an organic leaf-shaped dining room chair with legs suggesting a densely-wooded forest - an effect described by Karim as “sensual minimalism”). Imola chair in Orange Velvet fabric, Dimas rug. Fortunately, as all BoConcept furniture can be customised with over 100 fabrics and leathers, hardware finishes such as white lacquer and brushed brass, and tweaks to the style (our beloved pink Osaka chair has three different armrest options, and can be selected with tufted details on the seat or a simple, plain appearance), so restoring relationship harmony is not too hard to achieve. David also likes to find out whether the client has pets or children, and assess practical considerations, such as how many seats the room needs, and what the storage requirements are. He will sometimes suggest a home visit, as this can help to gauge how the natural light plays in the room, and take a look at the existing items of furniture to be incorporated into the scheme. Milano table, Adelaide chairs, Tait rug, Ball pendants. From this, mood boards and CAD drawings are created, including various BoConcept items of furniture and accessories, with suggestions for suitable paints (such as Farrow and Ball), wallpapers, and floorings. David explains that often he’ll liaise with a suitable supplier on behalf of the client, all as part of the service. 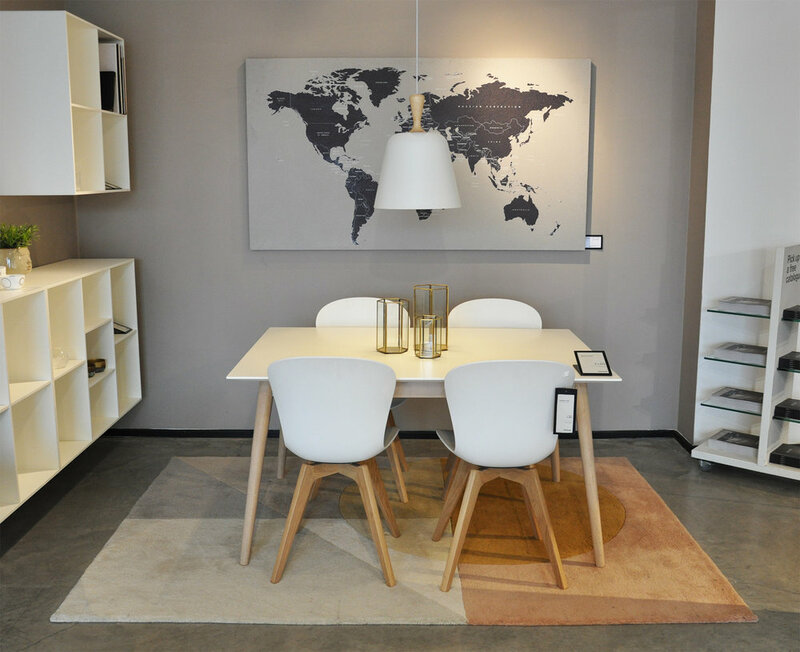 Finally, once the furniture has been delivered, the BoConcept Manchester team can visit the client’s home with a van full of their gorgeous accessories, to show how the new space can be dressed, and aid the client in selecting any final touches. Hexagon lanterns, Tulip ceramic flowers. Circle marble clock, Stockholm lamp, Cupertino Console. Can I remind you that this is all free? And in case you need any further persuasion, BoConcept Manchester are offering 15% off any products purchased as part of the interior design service in October 2018. As part of my collaboration with BoConcept Manchester, I’d like to offer all readers of Simply The Nest the opportunity to win a set of brass hexagon lanterns (shown throughout this post). Fill them with candles, succulents or fairy lights - the choice is yours. And of course the winner will be offered a free interior design service and in-store consultation or home visit (the latter if the winner’s closest store is BoConcept Manchester). Share a photo on your social media feed, and tag and mention @BoConceptManchester and @SimplyTheNest. The picture should either be of a BoConcept product in your home, or a moodboard, flat lay or otherwise styled image using pictures from the new BoConcept catalogue, titled ‘From Denmark. To the World’. To order a catalogue, a beautiful, tactile coffee-table style affair with embossed lettering on the cover and stunning imagery inside, please click here and fill out your details. You can then style images from your catalogue however you like - photograph it on your glass coffee-table or marble kitchen counter along with some late-summer flowers from the garden; create a flat lay using your favourite images ripped out from the catalogue; prop the catalogue up on your mantelpiece along with your favourite art pieces and accessories. You can also create an electronic moodboard using BoConcept images from the website, and share that. Be creative and have fun with it! I’m looking forward to seeing your images. The competition runs until Sunday 7 October. The winner will be chosen and announced by BoConcept Manchester, and must live in the UK. Here’s my take on this - some gorgeous images from the catalogue (I am absolutely swooning over the Fusion chair, designed by Oki Sato, and inspired by origami) along with various wallpaper samples used or planned for our house, paint pots, and fabric swatches. All images taken from the BoConcept catalogue, other than the two large-scale floral wallpaper samples. Star and faux marble tiles are from projects in our house. I’ll share a few different versions in the next few weeks on my Instagram feed, so do keep an eye out.